Stock House Plan or Custom Design? - Weber Design Group; Naples, FL. 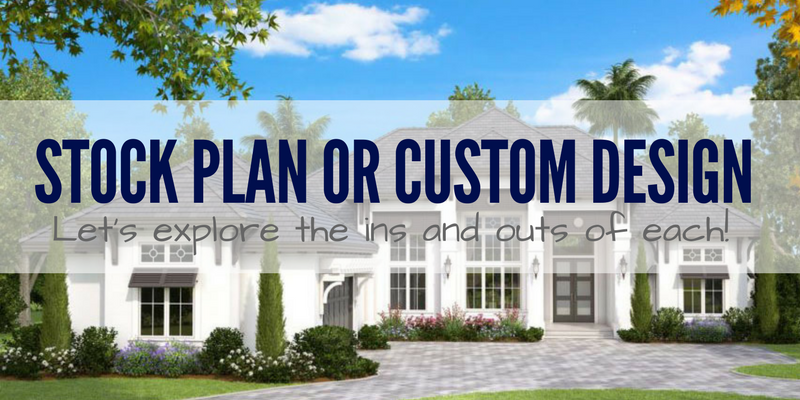 Home / Blog / Learning Resources / Stock House Plan or Custom Design? The good news is, your choices reside on a spectrum that ranges from the purchase of an unmodified stock plan to the development of a completely custom design, and on that continuum there are varying degrees of customization available to every client. A sweet spot exists where your budget, lot parameters and unique needs converge, and the result will be a dream home that you love. Let’s take a closer look at the major options, and explore the advantages of each. With a custom design you can essentially have everything exactly how you want it. The designer or architect will sit down with you to discuss your family’s lifestyle and desired features. He or she will evaluate your lot to identify constraints like size, shape, flood zones and municipality zoning requirements, as well as explore ways to maximize distinctive features of the view and location. You’ll also benefit from extensive consultation with the designer who can advise you on the best ways to achieve your lifestyle and budget objectives and create the utmost value for your property. Custom design involves a comprehensive preliminary stage where drawings will be developed illustrating design concepts for floor plans and elevations. This provides the customer with the opportunity to review and critique the designs, and to receive expert feedback from the design team. Upon finalization of the preliminary plans, the full set of architectural drawings are created and customized based on your approved preliminary drawings. The labor hours involved with this process accounts for much of the difference in cost between stock and custom design. A stock house plan, without modifications, may satisfy your needs for size, features and desired architectural style if your lot is fairly typical and does not have any constraints. With modifications, a stock plan can also be a great starting point for a semi-custom design that meets some special requirements. Extensive modifications requiring changes to more than 30% of the design will usually require a complete redraw. Even then, it may cost less than a completely custom design. Some examples of common design modifications are moving walls to add, remove or expand rooms; conversion from concrete to wood; elevating the home for beach and coastal lots; adding a basement and altering exterior elevations. When you purchase from and modify a stock plan with the original designer, you have the benefit of working with someone who has a full grasp of the original design concepts, and who can make your changes while preserving the integrity of the design. The original designer will be able to provide the best guidance about your desired modifications, so that consistent architecture is maintained throughout the home. Search our inventory of over 270 stock plans. Contact us to schedule a custom design consultation.